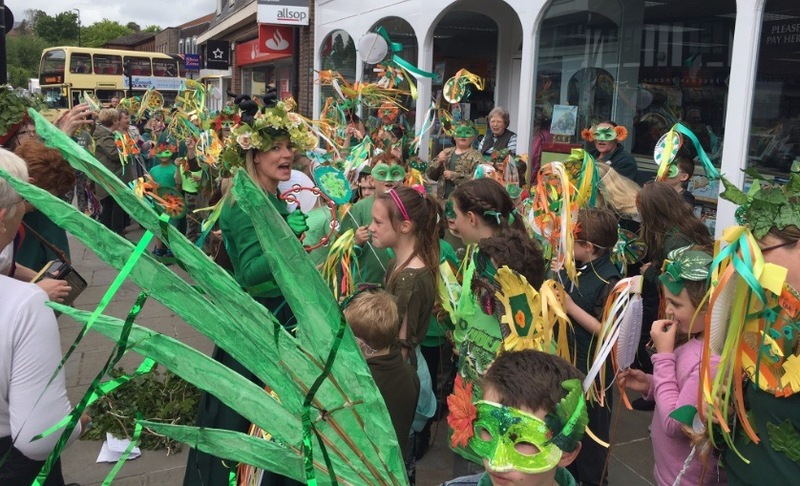 Holy Cross pupils parade in Uckfield High Street to celebrate their school being declared 'Good' by Ofsted. 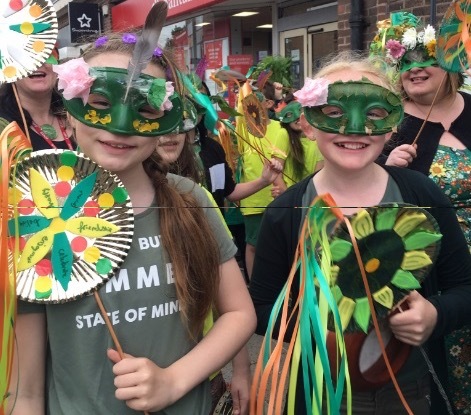 Holy Cross pupils took to the streets of Uckfield on Friday to celebrate as their school received a ‘Good’ rating from Ofsted. 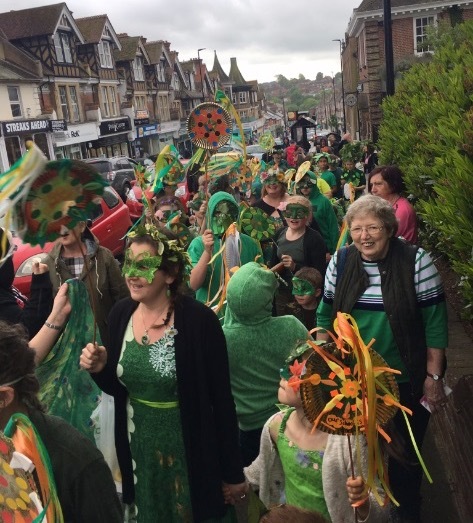 Holy Cross parades in Uckfield High Street. They repeatedly noted the school’s improvement and success in teaching and learning. Holy Cross pupils pause for a sing-song in Uckfield High Street led by their headteacher Cathy Dart. Happy faces in the Holy Cross parade. More singing for Holy Cross pupils as they reach school again following their High Street parade. 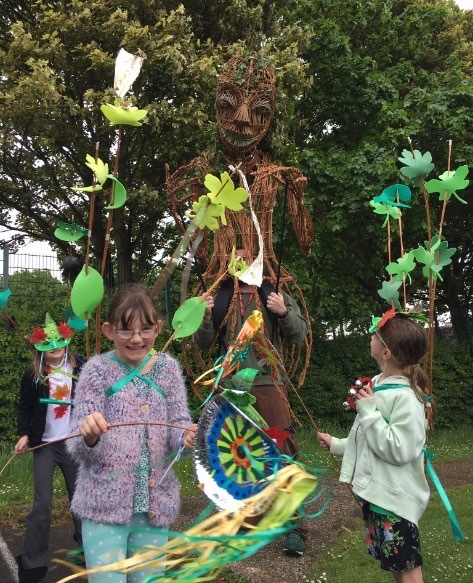 The ‘willow lady’ looks down on Holy Cross pupils. Leadership and governors were also commended in the report which said that since headteacher Cathy Dart’s appointment in April 2016 she had lost no time in developing the quality of teaching, learning, behaviour and leadership. “The headteacher and her team have secured substantial improvements in the quality of the teaching … pupils of all ages tackle activities with growing confidence, and express themselves with increasing clarity. Celebratory parade gets under way. 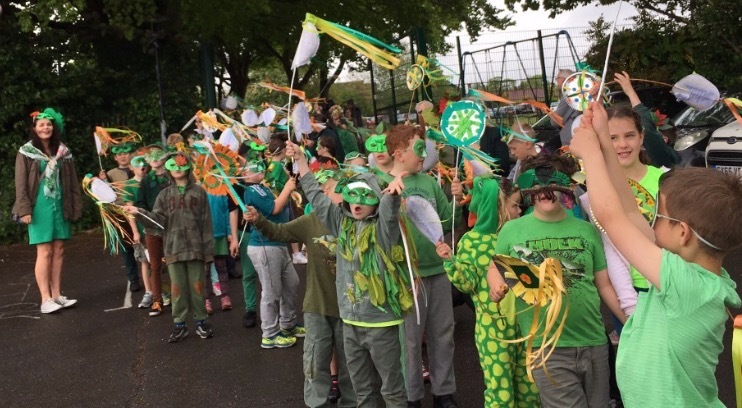 Friday’s colourful parade celebrated the start of a new era at Holy Cross Primary School. 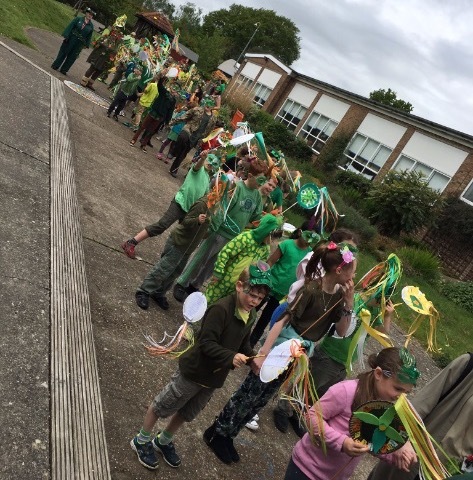 It was similar to a Hastings May Day Jack in the Green procession and pupils and staff were bedecked in green finery as they followed a ten feet tall lady made of willow and wrapped in ivy. 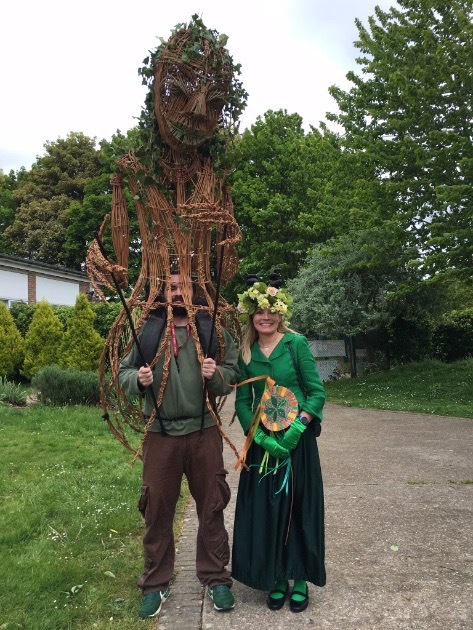 The ‘willow lady’ poses for a picture with Holy Cross Primary School head teacher Cathy Dart. 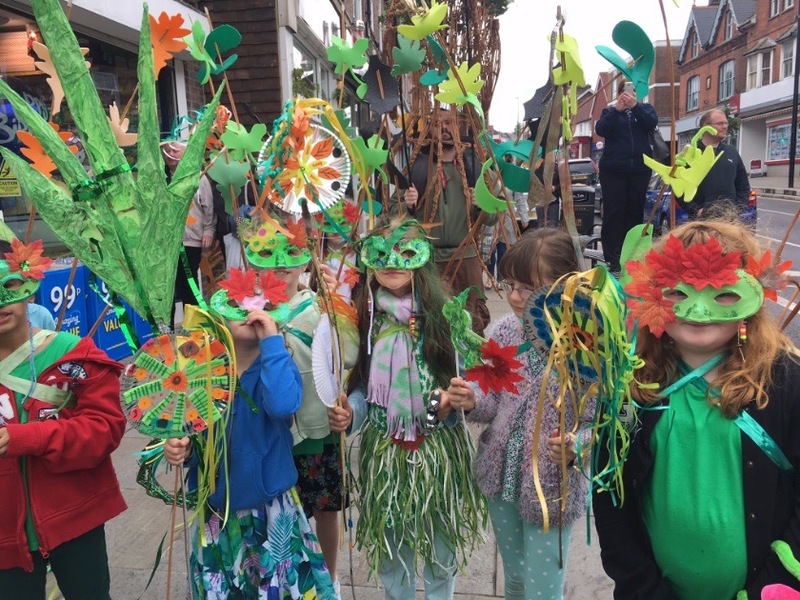 They ignored the rain and entertained shoppers and shop owners with a rousing sing-song half way up the High Street before carrying on back to school where an indoor picnic was followed by headteacher Mrs Dart presenting her staff with a thank you cake. Uckfield Mayor, Cllr Louise Eastwood, joined the celebration. 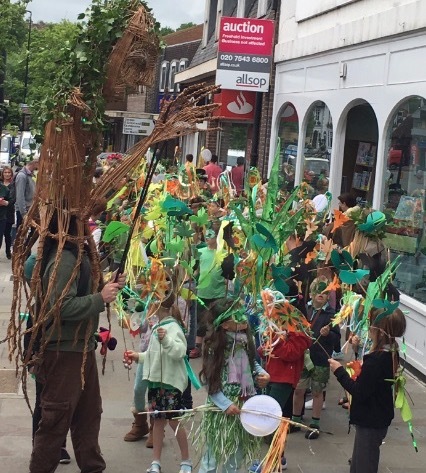 The ‘willow woman’ leads the Holy Cross parade. She said: “We are delighted to have finally got the Good that Holy Cross School deserves. All the staff and children have worked really hard to get this result and I thank them all. “I would also like to thank all our parents for supporting us so strongly over the past few years, and our governors who have provided the encouragement we all needed. 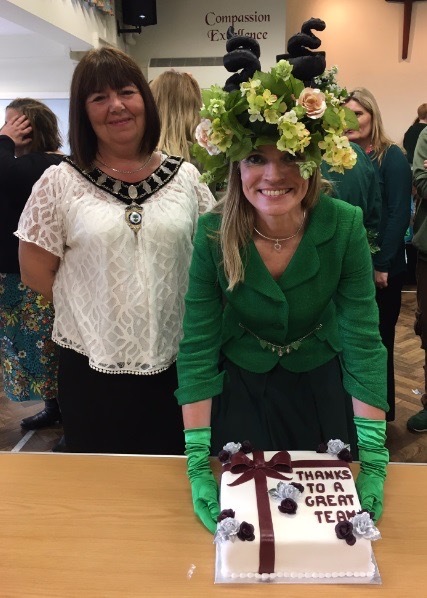 Uckfield Mayor, Cllr Louise Eastwood, joins the Holy Cross celebration as headteacher Cathy Dart displays a thank you cake for her team. A time for celebration now that finally Holy Cross Primary School has got the recognition it deserves”.